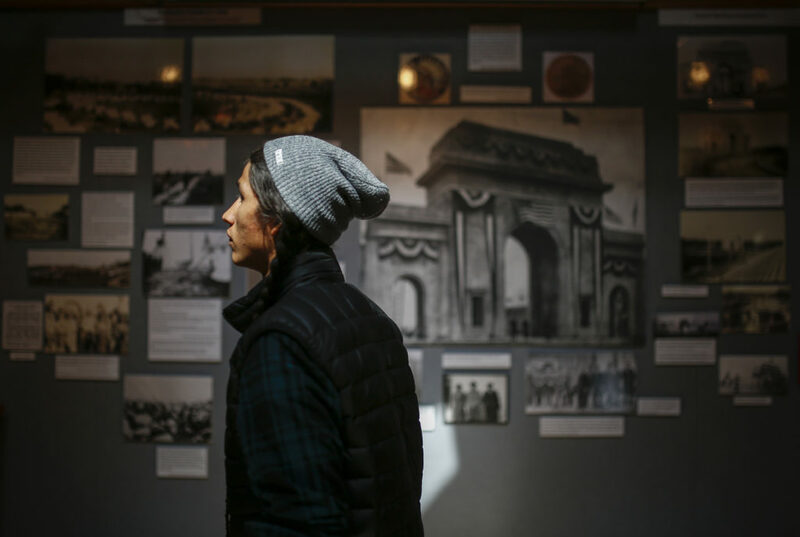 Haskell Indian Nations University freshman Cole Brings Plenty, Lakota, Cheyenne River Reservation, South Dakota, looks through the Haskell Memorial Stadium exhibit on Sept. 14, 2016 at the Haskell Cultural Center and Museum. Pop quiz: What Midwestern stadium was the first in the region to feature outdoor lighting? Hint: If you’re reading this in print, you might even be in the same ZIP code. Was your answer Memorial Stadium? If so, you would be correct. But not the Memorial Stadium at the University of Kansas. Haskell Memorial Stadium is the correct answer, according to Jancita Warrington, director of the Haskell Cultural Center and Museum. The museum is currently featuring an exhibit highlighting the tremendous efforts involved in the building of the stadium and its significance as it nears its 90th anniversary on Oct. 30. Listening to Warrington excitedly launch into all the history about the days leading up to the stadium’s inauguration evokes a vision of a World’s Fair-like atmosphere with thousands of “tribal people” attending and thousands of others converging on Lawrence for the four-day event. Lawrence Journal-World reports ranging from Oct. 28, 1926 through Nov. 1, 1926 offer more than a dozen stories recounting the various events leading up to the stadium’s inauguration, including a buffalo barbecue, the intertribal powwow world championship, the performance of the play “Hiawatha,” a parade down Massachusetts Street, appearances from famous Haskell alumni and visits by tribal chiefs to local schools. U.S. Sen. Charles Curtis, a member of the Kaw Tribe who later became the 31st vice president of the United States, gave the pre-inauguration address. Then at the first football game played at the stadium, the Haskell Institute players, all in high school, drubbed the Bucknell Bison, 36-0. Within the museum, the centerpiece image of the exhibit features the iconic and monolithic stadium archways, draped with banners and bunting. Another image shows legendary Haskell alumni Jim Thorpe, a college and professional football hall-of-famer, and All-American John Levi riding in the back of a luxury vehicle. In the driver’s seat is Buster Charles, who became an Olympic decathlete in 1932 and who also returned to Haskell for the inaugural event. “The early stars like Thorpe, Levi and others, they all came back for the love of Haskell and the love of their people,” says Warrington. Although Thorpe and Levi drew considerable admiration and attention, Warrington is quick to point out that the fundraising efforts for the stadium, which began in 1924, fell largely on the shoulders of football coach Frank McDonald, who led the capital campaign with a vision of a modest 2,000-seat stadium. Without giving too much away, a placard at the center of the room provides an account of a legendary 1924 football game in northeastern Oklahoma, where the Haskell 11, led by quarterback Levi and coach McDonald, defeated a highly touted opponent, impressing leaders of the wealthy Quapaw and Osage tribes. In turn, the two tribes collectively provided nearly $100,000 in donations toward the construction of the stadium, which had a $250,000 price tag. As a result of the game, the stadium was expanded to seat 10,000. For Warrington, the significance of the stadium and the events of the inauguration extend well beyond the physical structure and the game of football. Warrington pointed out that many of the scheduled events — the dancing at the powwow or the performance of “Hiawatha” — were in sharp contrast with the government’s efforts to assimilate indigenous people, and, in turn, the efforts of Haskell Institute, which at the time was a military-style boarding school for indigenous youth. She believes that the inauguration was influential in helping change federal policy, which she says was evident in the years shortly after the event. “Prior to (the inauguration) they couldn’t practice their arts and culture here,” Warrington said. “Hiawatha” was an Indian-based play that was written in many different languages. On Wednesday, Warrington led a Haskell orientation class through the museum and facilitated a scavenger hunt for information relative to Haskell as an exercise to familiarize new students with the university’s roots. Students approached her with questions as they experienced the exhibit.